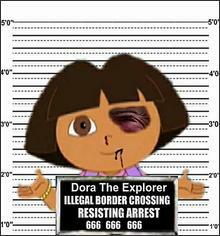 Drunk Nothings: Is Dora the Explorer an illegal immigrant? With the immigration issue heating up I guess it was only a matter of time until someone questioned Dora and her status when it comes to the United States. But as we can see she was clearly not legal as she has apparently been arrested and resisted arrest. Just goes to show that this issue is on the front burners.